What does Kanye West's appearance say about Nando's success? Prior to his performance at the BRIT awards, international rap superstar Kanye West decided to have a pre-show meal at what was ostensibly a bizarre choice – high street chicken restaurant chain, Nando’s. Of course, videos emerged of the rap mogul a top a table in the restaurant, milking the applause from fans. As well as a huge PR win for the brand, it helps to point towards why it has had great success in recent years, with an inexorable expansion and popularity rise characterising its journey. The impact of this particular appearance on Nando’s YouGov BrandIndex ratings shows the effect a celebrity endorsement can have. 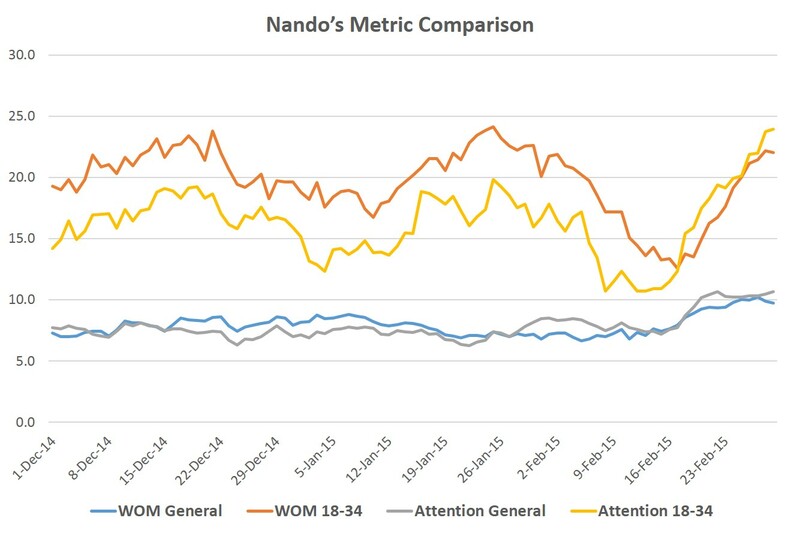 Following the meal in late February, the WOM Metric (whether a respondent has talked about a brand with somebody in the last two weeks) we see a moderate rise among all respondents from 6.6 to 10.2. Among a key demographic, 18-34 year olds, we see a far more dramatic increase of 13.2 to 22.2. This trend is repeated when looking at our Attention metric. The rise among all respondents is from 7.2 to 10.6, while among the younger age group we see the score move from 10.9 to 23.9. It isn’t just Mr West that has been spotted enjoying a spot of chicken. Music stars such as Ed Sheeran, sporting champions like David Haye, and even the Prime Minister back in 2013, have all been pictured in store. This is not superfluous coincidence, it shows that the brand is an attractive proposition across all manner of demographics. As well as attracting younger eaters on a budget, families, couples and even those with more disposable income are attracted by the simple yet effective offering. Nando’s is by far the most popular restaurant chain on social media, with more than double the followers of its nearest rival. It’s often irreverent tone resonates well with younger users. YouGov Profiler indicates the vital role heavy emphasis on this area will have on the brands success. Assessing customers of Nando’s we see that what differentiates them from their comparison set is the central role the internet has in their daily lives. Typically online for 50+ hours a week, they describes themselves as ‘not being able to manage without the internet’, while also saying they ‘like to go to trendy restaurants and bars’. The brand therefore, has the perfect blend of factors contributing to its success. It is popular among younger consumers who are more in tuned with the very effective social media campaigns that it runs. It also appeals more importantly to many other demographics, whether social, age or religion, there is a belief the restaurant caters for them. The fact celebrities dine there too, adds to the lustre and the positive perception of the brand.